Determining who is liable for a side impact motor vehicle accident can be elusive, as these types of collisions may occur in a number of traffic conditions; however, per Florida’s negligence standards, either driver might be considered at fault. At the Shiner Law Group, our award-winning personal injury attorneys have dedicated over 15 years to representing victims in cases arising from negligence. We have the results-driven approach and legal acumen to help you obtain the financial compensation you need to recover from your accident. If you or your loved one has been involved in a side impact, or “t-bone,” collision, call us or visit our website to discuss your legal rights and responsibilities in a free consultation. The Shiner Law Group provides legal services on a contingency fee basis, which means that you do not pay unless we win your case. The fundamental legal processes associated with side-impact collisions are virtually the same; however, the facts and circumstances are inherently unique to each case. As there is limited protection for drivers and passengers when a motor vehicle impacts your car, the risk of personal injury – and even wrongful death – remains ever present. Unfortunately, these types of accidents are responsible for over 8,000 deaths per year in the United States. Determining fault in a side impact collision is rather straightforward, as most cases in Florida characteristically involves two parties: the at-fault driver and the driver who sustained injury. But to avoid liability, the other driver may claim they had the right of way and attempt to shift fault. Call Emergency Services: A police officer can file an accident report and make a preliminary assessment of how the accident occurred, which may also detail the conditions at the crash site. If conditions permit, move away from the flow of traffic and seek medical attention, regardless of the extent of your injuries. Record the contact information of eyewitnesses or passersby who rendered aid. Do not admit fault or give statements that may suggest fault. If an insurance company requests a written or recorded statement, consult legal counsel. Take picture evidence of the crash site, taking into account road conditions, the time, weather, and any actions taken prior to the collision. In rare circumstances, a defective component may cause a driver to collide with another motorist. Your personal injury attorney can help you bring a claim against potential manufacturers or mechanics who were responsible for the maintenance of your vehicle. 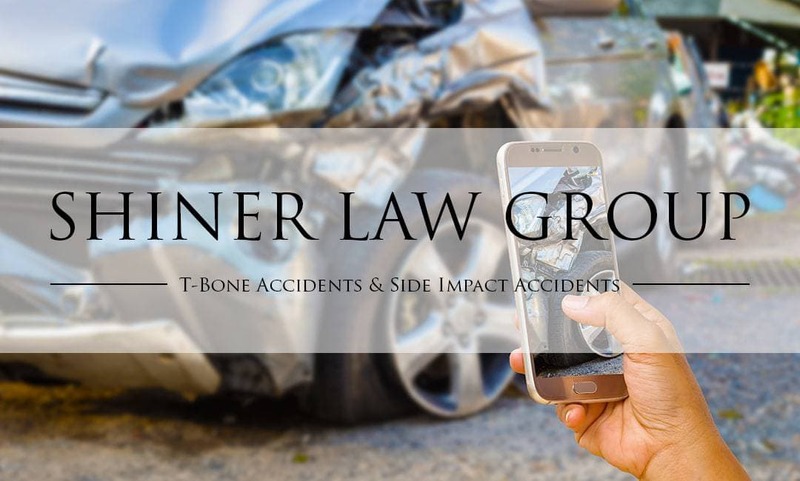 If you or your loved one has been injured in a Florida side impact accident, David I. Shiner and our personal injury attorneys at the Shiner Law Group are committed to helping you build a compelling claim, so you can obtain the most substantial outcome. Our trial lawyers conduct a thorough and independent investigation of the crash site, quantify your damages, and determine the appropriate defendants by working with a team of accident reconstructions to establish fault. We make every effort to ensure fair compensation is negotiated outside of court; however, if insurance companies fail to settle your case in a reasonable manner, our law firm is prepared to go to trial to fight on behalf of your legal and financial interests.